Hydrogen peroxide is the simplest form of peroxide that acts as a strong oxidizing and bleaching agent. It can be manufactured through various manufacturing processes; however, anthraquinone autoxidation is the most widely used process. Hydrogen peroxide is used in various end-use industries such as paper & pulp, chemical, mining, wastewater treatment, and electronics due to its eco-friendly applications. Inhalation of hydrogen peroxide can cause irritation of the nose, throat, and respiratory tract. Accumulation of fluid in the lungs may occur in severe cases. Diluted solutions of hydrogen peroxide may cause bleaching or whitening of the skin. Contact with high concentration of hydrogen peroxide can result in severe burns, blisters, irritation and redness, ulcers, and permanent scarring. If high concentration of hydrogen peroxide comes in contact with the eyes it can result in conjunctivitis, pain, severe eye burns, sensitivity to light, and also permanent injury, including blindness. Rapid pressurization and peroxide/organic vapor phase explosions are also some critical safety concerns related to hydrogen peroxide. Therefore, potential health hazards associated with hydrogen peroxide can hamper the global hydrogen peroxide market. However, the steady rise in demand across key end-use industries will result in promising growth opportunities for the global hydrogen peroxide market over the report’s forecast period. According to the report, the market was valued at US$ 2.44 Bn in 2016 and is likely to reach US$ 3.68 Bn by 2025, expanding at a CAGR of 4.7% between 2017 and 2025. The key applications of hydrogen peroxide covered in the report include usage across paper and pulp, chemical, waste water treatment, and mining industries. Of these, the paper and pulp industry accounted for a substantial share of the global hydrogen peroxide market in 2016. Hydrogen peroxide is extensively used as a bleaching and oxidizing agent in the paper and pulp industry. Use of hydrogen peroxide helps achieve a grade of brightness that is suitable for high-grade magazine papers, board, and tissue products. Demand for hydrogen peroxide is expected to increase from this industry in the near future owing to increasing usage of paper across the globe. Advent of internet and digitalization has reduced the use of newsprint paper in developed countries. However, rising demand for paper in personal care and packaging industries in developing countries has propelled the overall demand for paper. The chemical industry also uses hydrogen peroxide. Rising adoption of the hydrogen peroxide in the production of propylene oxide is anticipated to boost the demand for hydrogen peroxide in the chemical industry in the near future. The other uses of hydrogen peroxide are found across industries such as in textile, electronics, and food processing. Hydrogen peroxide is used in the electronics industry for pickling of metal surfaces. It is also used to bleach natural and synthetic fibers in the textile industry. Geographically, the market in Asia Pacific accounts for a major share in terms of consumption and production of hydrogen peroxide on a global front. The market in the region is driven by rising demand from paper and pulp, chemical, and wastewater treatment industries. In terms of value, the market in Asia Pacific is anticipated to expand at a CAGR of 5.3% between 2017 and 2025. Europe and North America follow Asia Pacific in terms of volume. North America accounted for a substantial share of the global hydrogen peroxide market in 2016. The paper and pulp industry dominated the market in the region in 2016. Latin America and Middle East and Africa accounted for the least share of the market in 2016. However the regional markets are projected to rise at a rapid rate during the forecast period. Key manufacturers operating in the global hydrogen peroxide market are Solvay S.A., Evonik Industries AG, Arkema S.A., National Peroxide Limited, Mitsubishi Gas Chemical Company and others. Hydrogen peroxide is a basic chemical compound, available in liquid form at room temperature. The product is slightly more viscous than water. It is the simplest peroxide available and is basically used as an oxidizer, bleaching agent and antiseptic product. Hydrogen peroxide can be manufactured through various manufacturing processes; however, anthraquinone autoxidation is the most widely used process. The product is used widely in various end-use industries such as paper & pulp, chemical, mining, wastewater treatment, and electronics due to its eco-friendly applications. The report estimates and forecasts the market on the global, regional, and country levels. The study provides forecast between 2017 and 2025 based on volume (Kilo Tons) and revenue (US$ Mn) with 2016 as the base year. The report comprises an exhaustive value chain analysis for each of the product segments. It provides a comprehensive view of the market. Value chain analysis also offers detailed information about value addition at each stage. The study includes drivers and restraints for the hydrogen peroxide market along with their impact on demand during the forecast period. The study also provides key market indicators affecting the growth of the market. The report analyzes opportunities in the hydrogen peroxide market on the global and regional level. Drivers, restraints, and opportunities mentioned in the report are justified through quantitative and qualitative data. These have been verified through primary and secondary resources. The report includes Porter’s Five Forces Model to determine the degree of competition in the hydrogen peroxide market. The report comprises a qualitative write-up on market attractiveness analysis, wherein application type and countries have been analyzed based on attractiveness for each region. Growth rate, market size, raw material availability, profit margin, impact strength, technology, competition, and other factors (such as environmental and legal) have been evaluated in order to derive the general attractiveness of the market. The report comprises price trend analysis for hydrogen peroxide between 2017 and 2025. 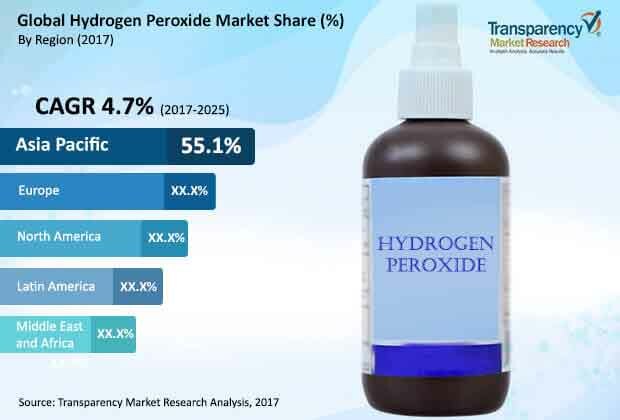 The study provides a comprehensive view of the hydrogen peroxide market by dividing it on the basis of application and geography segments. The hydrogen peroxide market has been segmented into paper & pulp, chemical, waste water treatment, mining and others based on application type. Application type segment have been analyzed based on historic, present, and future trends. Regional segmentation includes the current and forecast demand for hydrogen peroxide in North America, Europe, Asia Pacific, Latin America, and Middle East & Africa (MEA). Additionally, the report comprises country-level analysis in terms of volume and revenue for various segments. Key countries such as the U.S., Canada, Germany, France, the U.K., Spain, Italy, India, China, Japan, South Africa, Mexico, and Brazil have been included in the study. Market segmentation includes demand for individual application type in all the regions and countries. The report covers detailed competitive outlook that includes market share and profiles of key players operating in the global market. Key players profiled in the report includes Solvay S.A., Evonik Industries AG, Arkema S.A. and others. Company profiles include attributes such as company overview, number of employees, brand overview, key competitors, business overview, business strategies, recent/key developments, acquisitions, and financial overview (wherever applicable).